I love to use cloth diapers as burp cloths for my babies. They are so absorbent, and a lot cheaper than buying regular burp cloths at the store! 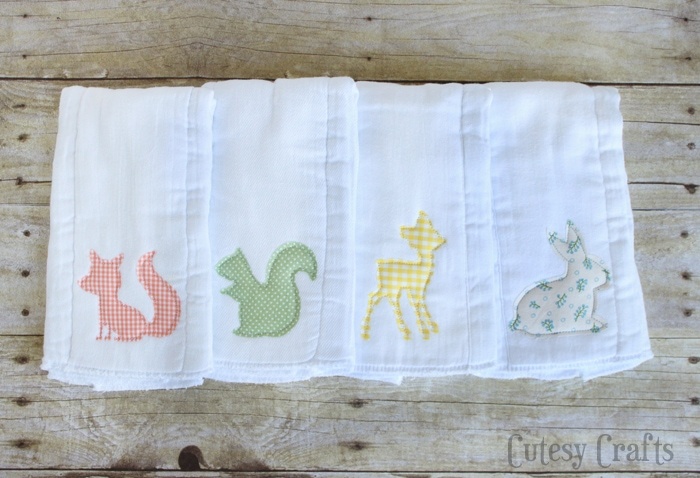 I wanted to dress mine up a little, so I added some woodland animal appliques to match the muslin swaddling blankets that I made. I used my Silhouette Cameo to cut the appliques, but you can definitely make some of your own DIY burp cloths without one. My Silhouette just makes it a lot easier/faster to cut the detailed parts of the designs. 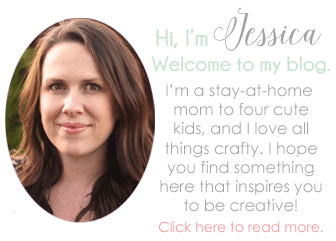 If you like this post, be sure to check out my other baby crafts as well. I’ve written up a full tutorial on how to do this below, but this video that I made a while back might also help. 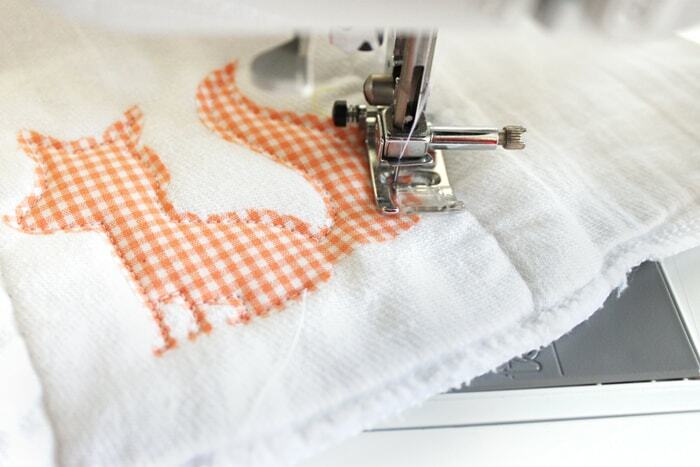 It shows how to cut an applique using the Silhouette. First thing you need to do is cut a piece of fusible interfacing slightly smaller than the piece of fabric that you are using. Place it with the webbing side down on the back of the fabric. 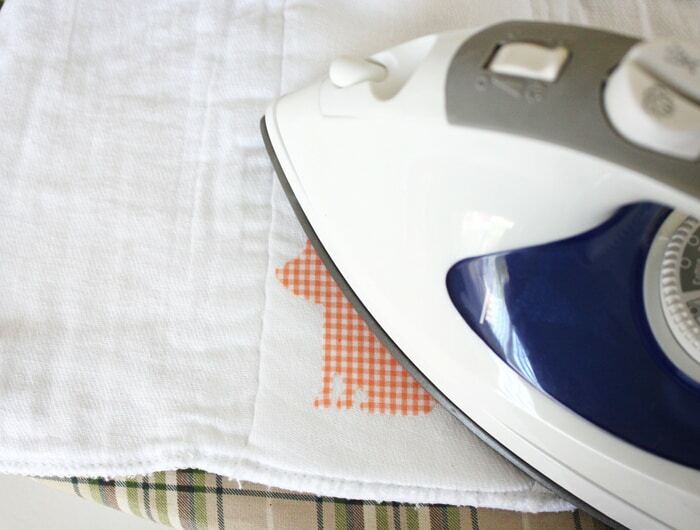 Follow the instructions on your product and iron it on. Put the applique on the bottom, middle of your cloth diaper/burp cloth and iron it down. 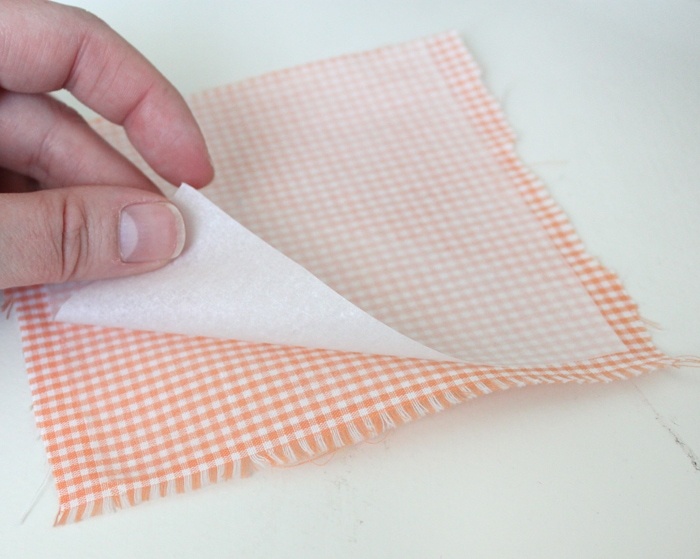 To make sure it doesn’t come off during washing, sew around the design. Get as close as you can to the edges without going off. And you’re done! 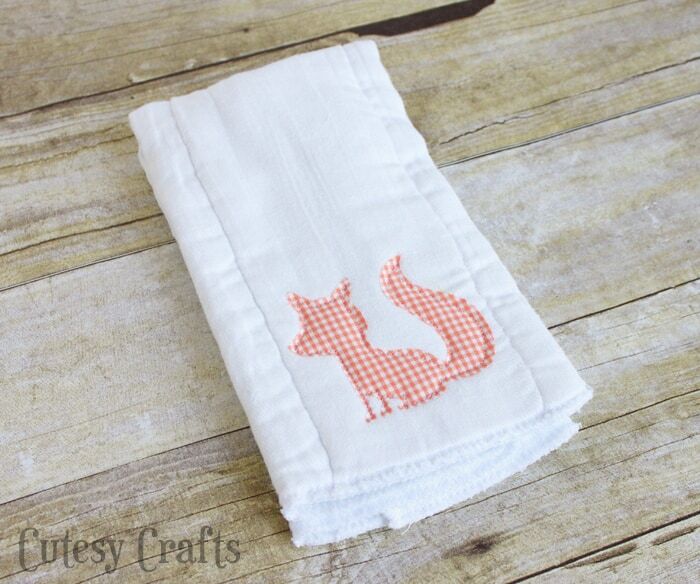 Much cuter than a plain white cloth diaper for a burp cloth! 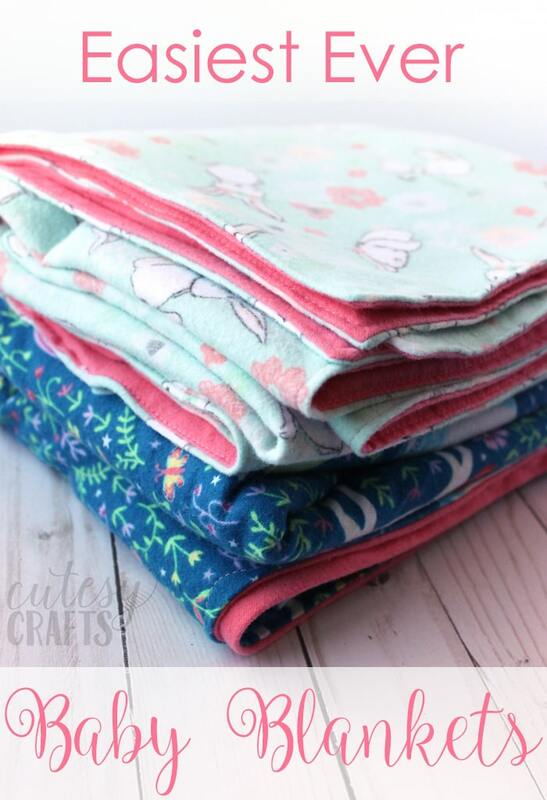 My friend made us a bunch of these cloth diaper burp cloths and they were amazing! I love how you chose an animal theme. I haven’t cut fabric with my Silhouette yet but I do have a fabric blade all ready to go. Pinning for future reference. Thanks for sharing your tips. Thanks, Kelly! You definitely need to try fabric. I love it! 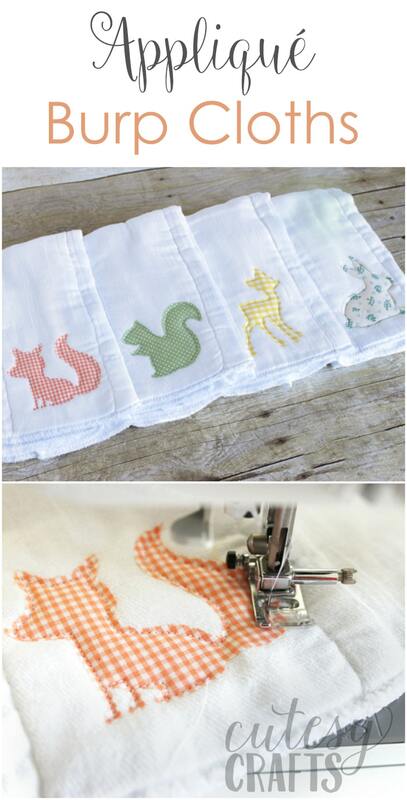 I love these–I really have to try out the applique thing–I’m intimidated by it! It’s SO easy! You definitely need to try it! What settings do you use on your Silhouette to cut these pieces of fabric with the heat n bond on them?? I just use the fabric settings that are pre-programmed into the software. Heat n Bond is basically the same as the Silhouette brand interfacing. 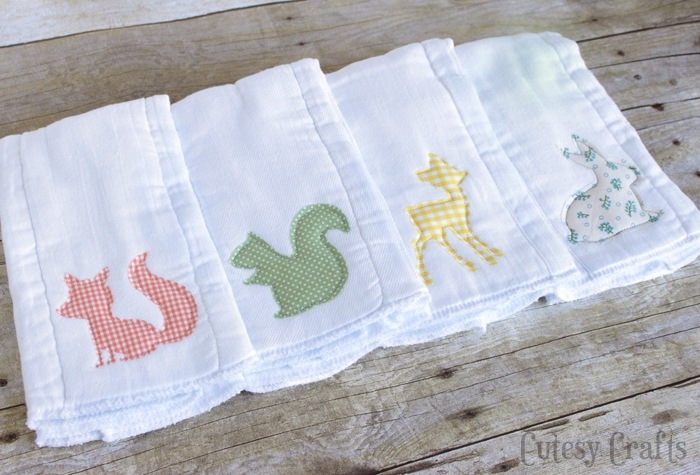 These are just adorable…as are the rest of the little woodland creature baby items you’ve been crafting! Your little one is going to have his own little line of super cute baby products! I can’t explain how adorable these are to me! I love the way they look after you sewed them on. Precious! Oh my goodness! These are adorable! Now I need friends that are having babies so I can make some! These are just too adorable! This definitely makes me want to test out fabric on my Cameo….and makes me even more envious that I can’t sew! It’s on the bucket list, so maybe I’ll eventually get around to picking up another skill. 🙂 Thanks so much for sharing! Yes, it helps to keep the edges from fraying. Thank you! 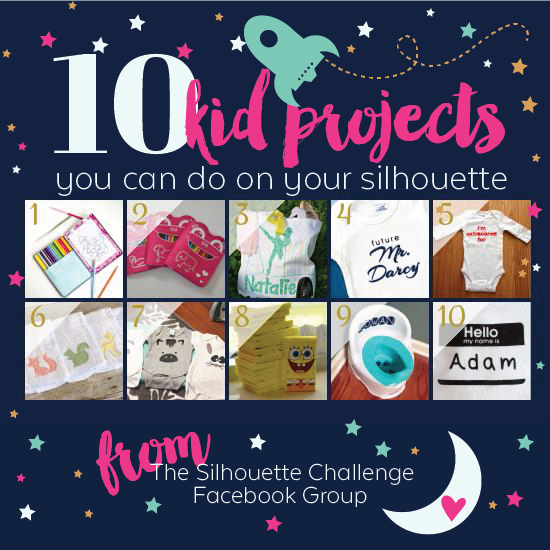 If you like to make appliques, you would definitely love having a Silhouette! You can get so much more detail and save so much time using it for the cutting. I’ve always wanted to do a onesie station at a shower. Maybe someday. It’s all going to depend on how often you use your blade. 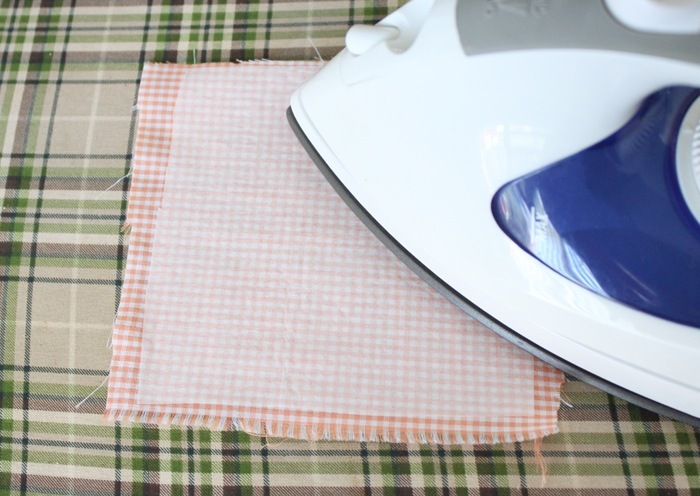 You’ll definitely want a separate one for cutting fabric vs paper, that will keep it sharper. They sell a blue one so you can separate the two. 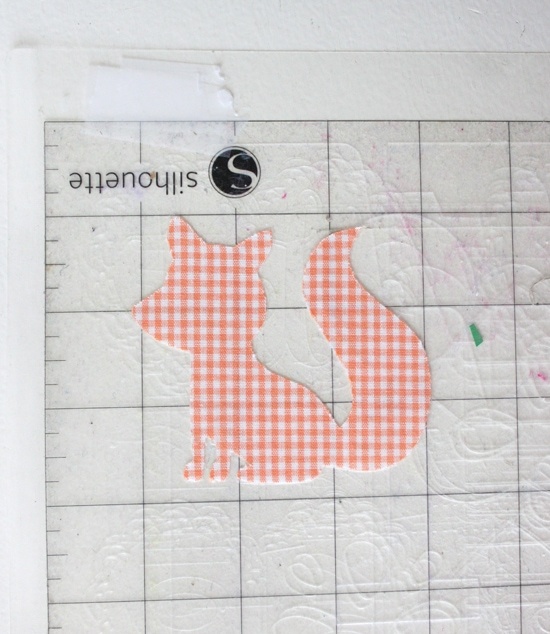 I’ve only ever bought one fabric blade, and it still seems to be working ok. With both the Silhouette and the new Cricut, you can design your own shapes to cut out. I believe the Silhouette has a special thing you can use to scan and cut directly, so that would be good with your colorbook images. I don’t recommend buying the Silhouette brand interfacing. It’s the same as Heat N Bond, but Heat N Bond is cheaper and you can buy it at the fabric store. Just looked at your oneseies on that pinterest board. SO CUTE! I believe I bought them at Walmart (Gerber brand), but they are hard to find like this now. Make sure they say 6 ply on the package.